I hear the words, “I hate religion.” I hear them in my mind but they refuse to dwell there in solitude. I vocalize them… often and sometimes with intensity. If “the service and worship of God,” defined by Webster, is an appropriate explanation of “religion,” then by all means in some senses Christianity is a religion. Hopefully, what we insinuate by these thoughts-become-words is understood against a backdrop of contemporary disorientation when discussing Christianity and the term religion. For you see, with a little explanation, this may be an accurate statement. But how so? So to throw every use of the word out of our vocabulary isn’t necessary to come to the same conclusion as Jesus when He voiced His hatred for the Pharisee’s religion (Matthew 23). Most often when believers in Christ say these words (I hate religion), we are referring to a humanly crafted method of getting to God. In other words, a works-based religion. The “I do something for God, so He does something for me” mythical syndrome. Man made religions are driven by rules and by performance; these seek God’s approval through self-empowered activities. When this topic comes up I usually remember the story of the tribal chiefs sitting around a fire with a Christian missionary. They are busy describing how God is seated at the top of a very unassailable mountain peak. Each of their religions explains how they strive to climb the mountain and get to their gods. The missionary then offers to tell them of the God who came down the mountain instead. We hate religion when it confounds the gospel of Jesus Christ. The story of the God who became a man and rescued His people refuses to coexist with a religion that rewards the efforts of men. Jesus didn’t come to give us a new religion. He came to offer something transcendently better than religion. He came to redeem His fallen world from sin and death. In this light, Jesus does hate the religion of men for He gives His redemption freely. 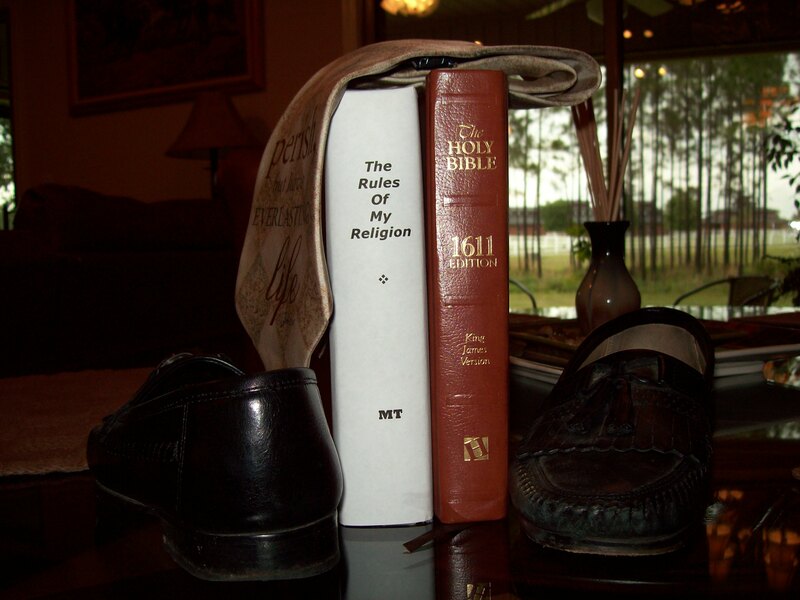 This entry was posted in Religion, WordPosts and tagged Christianity, John Stott, Pharisee, religion. Bookmark the permalink. 21 Responses to I Hate Religion: What Does That mean? Reblogged this on Empathy Link. I am always thankful when people call me religious because it is an open opportunity to witness. I start by disagreeing with them and saying that religion is a curse and the cause of many wars and arguments, but then I declare I am a blood-bought, adopted child of the living God and what that means. You’re showing up on the Religion/News frontpage. Nice! Wow! Thanks good friend! Am I famous yet? 🙂 According to the stats… I think not. If we define religion as “to repeat actions that have been traditionally given to us”. then we can do anything religiously. Christianity has given us traditions to help us become like Christ. The bible infers that God requires traditions. The question I have, ‘is every tradition handed to me helping me?’ Contempoary Christianity has its traditions, like communion and need to be done forever. But reading annoucments, kissing the rig of our elders and having the same enemies as our elders need to be questioned. My parents watched the teacher write on a blackboard. if my grandchildren are looking at a blackboard that school system is failing. My parents worhiped God standing and sitting in a building with pews. If my grandchildren worship that same way Christianity is failing. Each generation must become more like Christ and not become keepers in a musem of old revelation. Great post my friend. “a museum of old revelation” ~ Yes, there are many traditions and even societal influences to contend with. Still, I’m reminded of a good friend’s recent words, “Just because something is old… or new, doesn’t make it best, only what is truth.” The Gospel remains the Gospel, it must. Everything else is a tool for its disposal. Blessings friend. Words…Judgments…Discussions…Debates…Theology…Christians caught up in all of this while the lost remain in darkness. Did Jesus ask Christians to do all of this or did He command us to be a light in the darkness so that others can find Christ. What does any of this matter, if one soul is lost in the process because Christians, like the Pharisees, spend their time defining words, debating, discussing, judging, etc. If all a Christian has to work with is John 3:16…that is more than enough to shine a light in the darkness and do what Jesus wants us to do. Taken well on this end good friend. 🙂 I would agree that if all we had was the revelation through John 3:16, we could know that God loved His world, gave His Son, and that belief in His Son privileged His people with eternal life. However, that’s not all we have. We have Jesus commissioning His disicples to make more disciples, teaching them all things that He taught. This means we’re not only to be the light of Christ to the lost, but a directing path to the saved. The point of the post is simply to be a reminder that we once could sing, “Give me that old time religion,” and the hair on the back of our necks wouldn’t rise. Through the generations of the Church, the definition of this term wasn’t equated with something negative, but quite the opposite, something very positive. The Church was able to use this term for itself, while distinguishing it from the religion of the Pharisees, man-made and self-edifying. Still, you bring a great point to the table. It is very easy to consume ourselves with a whole lot of nothing. We can get caught up in the not necessarily bad things, but not the best things either. As said, point taken well. Thanks and many blessings Butch! I used to use this term! But now the rejection of this term actually bothers me. Because, by any rational defintion, Christianity IS a religion. Period. To argue otherwise, makes us look like fools to those who reject Christ. Do we attend religous services? Yes! Do we read a book that tells us about God? Yes! Do we conform our lives to the truths taught in those services and the book? Well, we should. I understand what well meaning people mean when they say this stuff. But think about it. There are good religions and bad ones. There are true and false ones. The historic Christian faith is both a true and good religion, in my humble opinion. I sometimes think that our emphasis on “It’s not a religion but a relationship” is a way for us to disgard the ethical demands the King places on His followers. “Religion” means rules and regulations, do’s and don’ts, which we want nothing to do with. The problem, as I see it, is that Jesus placed many demands on us. We gave us many things to do and not do. Today, I see Christianity more as a way of living, than I do as a religion. But a religion, nevertheless. Yes, as you make note of Jim, I understand how we got here, even to a degree agree, but I can’t help wonder as you mention how ridiculous this claim sounds before those outside looking in. It’s pretty obvious we meet the criteria of being a religion by Webster’s definition. None of the Saints of old had a problem labeling us as such. It’s pretty much what we’ve done with the word that causes the giving off of the evil aroma. As you note, there’s the descriptive s ‘good’ and ‘bad’ when we need to distinguish. Excellent points… thanks! There was a youtube video about hating religion that went viral. The young man made many good points. But what this phrase reflects is the deep illiteracy of our day. No one who has read the great leaders throughout Christians history could say such a thing. Augustine, Luther, Calvin, Wesley…Tozer, C.S. Lewis…they all spoke of true religion versus false religion. The new fad came from our evangelical mantra ‘Christianity is a relationship, not a religion.” And, of course, the above named saints new that those two words were connected by the holy conjunction “and” rather than being opposed. C.S. Lewis gave us a remedy. Few will follow it rather than the fad of the day. Lewis said that we should not allow ourselves to read another new book until we have read an old one. And if we do not have time to read both the old and the new, then we should read the old…that would be those like Augustine, Luther, Wesley, etc. Said Well! You have fully uncovered my point in posting these words. The term ‘religion’ has only become demonized by a generation who knows little of its consistent use throughout the history of the Church. That would be us by the way. I fully understand what is behind its removal and abandonment, and to a certain degree even agree, but as you so well say, it makes reading the old stuff very difficult. Might we be better to educate ourselves a little more as to the understanding of the term in its historical context rather than throw the baby out with the bathwater? Good message you give us. Many thanks… for the link also. You’re now bumping the borders of why I wrote this post, Judy. I think many of us today have that “somethings just not right” feeling towards this term. As I wrote, it was in recent generations that we placed this evil cloud above the word’s roof. There is reason of course, but I’m not so sure we didn’t create mass confusion, especially if we read the writings of long gone to their rest saints, who used this term interchangeably with Christianity. But then, the term was defined more clearly than today, as Mr. Webster still holds it to be, “the service and worship of God.” We also of course contend with relativism and humanism in this nation as never before, so maybe it’s the end of the word for our faith, still I can’t but wonder how Mr. Luther would respond… Thanks and many blessings. Good point. I guess we have also attached loaded meanings to the word, and maybe we over react accordingly. Thank you for the heartfelt response good friend. You are very right when you say we can allow religion to become the force that drives away hearers of the good news. Blessings as you serve our Lord! It goes even beyond this, I think. The fact is, Christianity is about God creating a people for Himself. This means that Christianity, at its heart, has a communal element. The Body of Christ. The People of God. The Church. Any community has to establish “rules”. There are behaviors that are and are not acceptable as members of a community. There are certain agreed upon markers of identity, as well. In this case, baptism and a confession of faith. This is even more important if we are a gathered community who are supposed to be a stark contrast to the world. We live differently. We think differently. We see things differently. Certainly, there needs to be room for maturation and growth, as well as avenues for both accountability and reconciliation. But the rejection of “rules” is much more a western phenomenon that stems from a misappropriation of freedom. Rules are necessary to establish the defining boundaries of community. To be clear, it is not works that save us. Salvation is by God’s grace alone. However, a Christianity devoid of faithfulness is a very shallow Christianity indeed. Great points. I think you distinguish well how we remain a people known only by our faith in the finished work of Christ, while yet realizing there is structure to our faith. What is organized to promote worship communally has to take on the characteristics of religion in some form. While we stand firm that it is the relationship we have with God that defines us, we should also be aware that those on the outside looking in can’t see our hearts any more than we can… they see a form of religion. Thanks and many blessings. Many Christians of various stripes have been taught that the terms “religious, religion” and Christianity are synonymous. Some forms of Christianity are more religious than others. In the Book of James, the Greek word used is “threskeia,” or “threskos,” which at its heart means “worship,” though can also denote religious discipline or possibly external ceremony. I think James meant the former. This word occurs four times in the NT. But the NT also at time equates the translated word “religion, religious” as mere superstition. What this means is more study is called for to bring greater definition to these terms. Thanks for beginning the discussion. Thanks RJ. Yes… more study. Good notation on the Greek word, friend.